When someone says not much has changed at a restaurant that’s been in business for 57 years, it’s usually an exaggeration. But at downtown L.A. seafood market and quick-service lunch spot Fisherman’s Outlet, truly, not much has changed. The mostly outdoor establishment has two sides connected by a short hallway. On one side there’s a market selling raw fish and cooked shrimp by the pound, plus cups of ceviche and shrimp cocktail. On the other, busier side, a few employees take lunch orders from the dozens of customers who always seem to pack the place. The staff doesn’t write anything down, ever. The analog system is a holdover from when Bill Shinbane started the market in 1961. It was intended to just be a small retail arm for the seafood importer, processor, and packager. When the warehouse moved five blocks away around 1970, Shinbane kept the property and expanded the offerings: mostly pre-cooked shrimp and smoked fish. The menu quickly changed—“he got tired of smoking the fish,” says Kopelowicz—to a long list of grilled and fried items, plus chowders and gumbo. Except for the sausage that goes in the gumbo, the menu is strictly seafood. 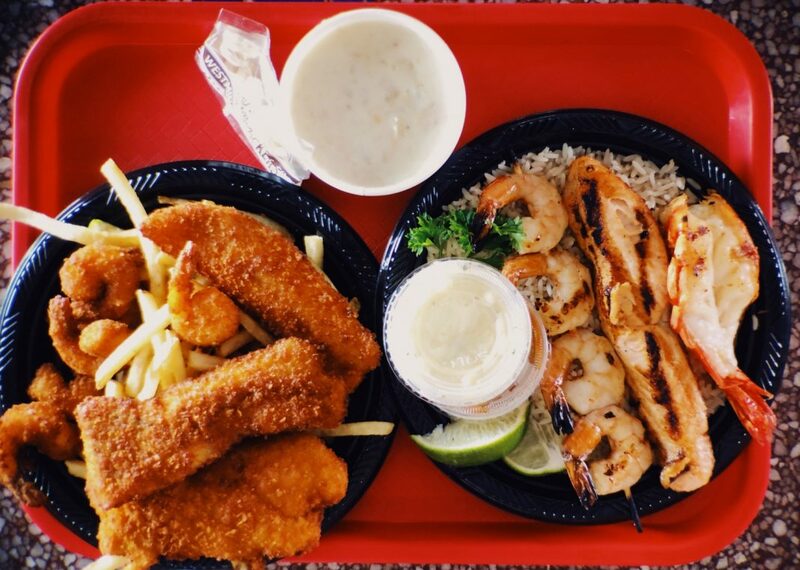 According to Kopelowicz, their three best-selling plates are the fried combo (shrimp and fish), the charbroiled combo (a giant shrimp, salmon, and a skewer of regular-size shrimp), and the grilled giant shrimp, massive butterflied prawns that are easily twice the size of regular shrimp. They’re high-quality and generous platters. (The founder specialized in shrimp, and it still seems to be a point of pride.) The New England clam chowder is exceptional, stuffed full of chopped clams and potatoes, and it’s always worth checking out the catch-of-the-day board to see if one of your favorites is available. Some folks order whole fried fishes. Shinbane and his wife (Kopelowicz declined to share her mother’s name) created the Fisherman’s Outlet recipes together. A local company makes the tartar and cocktail sauces they developed about 35 years ago, and the coleslaw and every other sauce is made in-house: garlic, cajun (which to some tastes like a marinara), teriyaki, pico de gallo, and mango salsa. The ketchup and Tapatio and Original Louisiana Hot Sauce are brought in. Still, the weekday crowd is much the same as it was in the 1960s and ‘70s: “Truck drivers, lawyers, detectives, people from the warehouses. Then on weekends those people bring their kids. We’re on the fourth generation of kids.” And there are no plans to change anything.